Today I am talking to Bob Yeager. In 1995, at the age of 17, Bob Yeager was recruited from a local college to interview at a telemarketing firm called Dial America. Within two hours of the initial job orientation and with no formal sales experience, Bob was asked to head up training of over 30 sales teams across the country in his unique approach to selling. 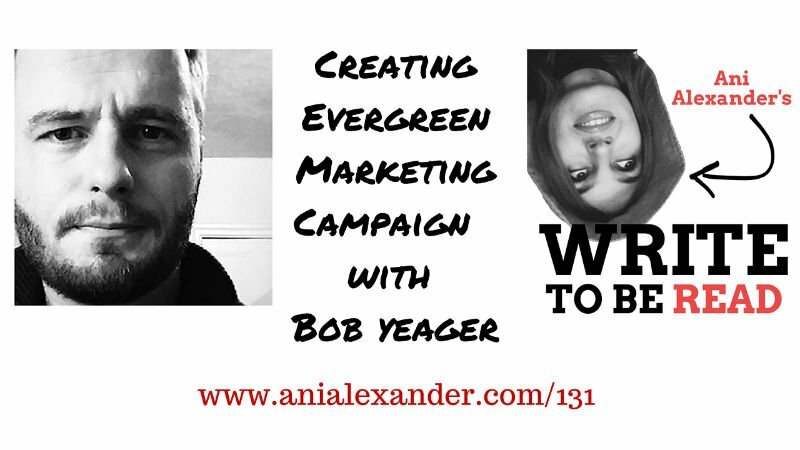 This interview is long but valuable so invest 1 hour in finding out how to create an evergreen marketing campaign for your books! It’s not about what you say about your book. It’s about what everyone else is saying before the book is even released. Sales and marketing it’s now a community of people who are going to talk about this message together and they’re going to make a group decision to buy it. Today what authors and marketers are doing is manufacturing media. If you want exposure on the Internet then every day you gotta produce something. Today’s marketing for everything you’re doing – you have to put a face and a voice now. You have to give people a character, a persona, a tone in a story that they can embrace. You have to be willing to engage with people. These days I’ve come across many articles and questions concerning Amazon’t new policy that will be implemented starting July 1st. At first it seemed confusing even to me, so I went through some stuff and decided to clarify things for you today. Before digging into this let me make one thing clear from the very start. This will only affect self-published authors whose books are available on Amazon’s lending services I mean those who self-publish their books exclusively through Amazon’s “KDP Select” program. It means that the news applies only at cases when Amazon prime members get your book for free from the Amazon Landing Library and if you are not enrolled at KDP Select program nothing changes for you. But what if you are enrolled at the program. Before the change each month Amazon fixed a price per each landed/downloaded book and paid everyone that amount. So basically each landed book was viewed as a sale and the price was set by Amazon. What will happen from now on? Well now what will matter is how many pages have the people who have landed your book have actually read. If someone downloaded your book and never opened it – you won’t get paid at all. So you will be paid for each page read. Some might think about fooling the new system by making the fonts bigger, double spacing the thing, etc, right? Well Amazon thought of it too and developed a “Kindle Edition Normalised Page Count” (KENPC) which standardises font, line height and line spacing. So that part has been taken care of. Since some have asked what I think about this here we go…. 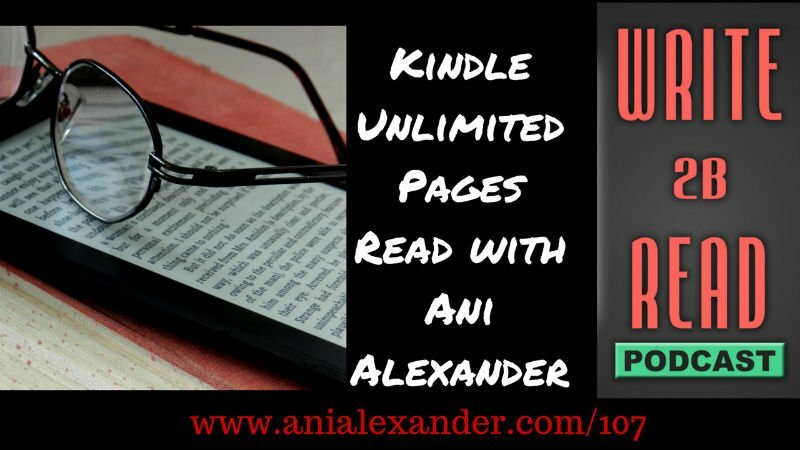 First of all it is good that the writers have the choice – it is only for the KDP Select authors, so if you don’t like the new system you can still sell your books on Amazon and be out of the KDP Select. Second I am thinking about my personal reading experience. I am not from those people who feel obliged to finish the book when they start reading it. In average I finish only 1-2 books out of the 10 that I pick up. I give a book chance of 20-30 pages – it either hooks me or it doesn’t and when it does’t I don’t feel like investing my time and attention into it. If the writer is not able to keep my attention and want me read more then he’s probably not a very good writer, right? So in that respect I think that it is fair. There are so many VERY short non-fiction books, which have only one main message and lots of air inside. There are non-fiction books, which were written in 2 hours. Why should their authors be paid the same as a thriller writer of 140k word book, who spent months writing the book? Maybe if that new system applied to all book sales and not only the landing library we would have less of those small non fiction crappy books which were outsources just to make passive income for the publisher? Maybe in that case only really good writers would make money and not those who don’t even write the books but outsource them and use keywords and stuff to get the downloads? Maybe, I don’t know… but I see the logic of encouraging authors who’s books readers want to read. The Goldfinch, by the Pulitzer Prize-winning Donna Tartt, was one of 2014’s biggest sellers. But I read today that data released by Kobo showed that only 44 per cent of readers who downloaded it read to the end. Maybe people downloaded it because it was an award winning book, because it was a bestseller and many spoke about it. But apparently over 50% of them did not like it enough to read till the end. On the other hand, as one of the authors stated – if we apply the same logic then it means we should pay for the burger according to how many bites we had… huh? So the new thing I spoke about today is effective July 1st. What I’d like to mention though is that it will be happening all the time. Amazon has been changing it’s algorithms many time before and it will be continuing doing so along with its policies. And it is good to know about the new things coming up and be prepared but what is ore important I think is to make you sure that you write the best book you can. Because if your writing is good, if it resonates with the reader, if it makes the reader feel and think, you will most probably succeed no matter what! Join the Write to be Read podcast birthday party by registering at here. I will be more than happy to meet you there on July 1st! Don’t miss the opportunity to join me and other Write 2B Read podcast listeners at our Facebook group. Today I would like to talk to you about the most exciting and at the same time scariest moment. That is the moment when what you’ve been working on for a while is put out to the word. Many of my guests have mentioned that the biggest challenge that writers are facing is hitting the publish button. Many writers complete their work and stop there. There are so many amazing stories hidden somewhere in someone’s computer folder or in someone’s drawer. Besides the emotional pressure we are having with ourselves, by putting our work out there we are putting ourselves in a situation where we also have to deal with others. By publishing our work we kind of give permission to people to read it and later publicly share their opinion about it. The opinion, which can’t be predicted in advance. The opinion which can’t be silenced if it’s not what you hoped for. So, does it mean that those who hide their writings are right? Well… I don’t think so. Because along with all the things I said there is another side to this. What if your book helps someone? What if your book inspires people? What if people need to get the message you’ve shared in the book? What if your writing will help someone escape the reality, forget their problems and re-live the lives of your characters? What if people will actually like it and the book does well? You will never know what will actually happen unless you publish. So you have 2 choices. Either keep that writing to yourself and keep dreaming seeing your name on book’s cover knowing that the dream will never come true… or collect all the courage you have, take the risk and hit that publish button. I know it’s hard. I know that you have to get out of your comfort zone for that and that taking risks is scary… But I also know that nothing amazing in life happens until you leave that comfort zone of yours behind. 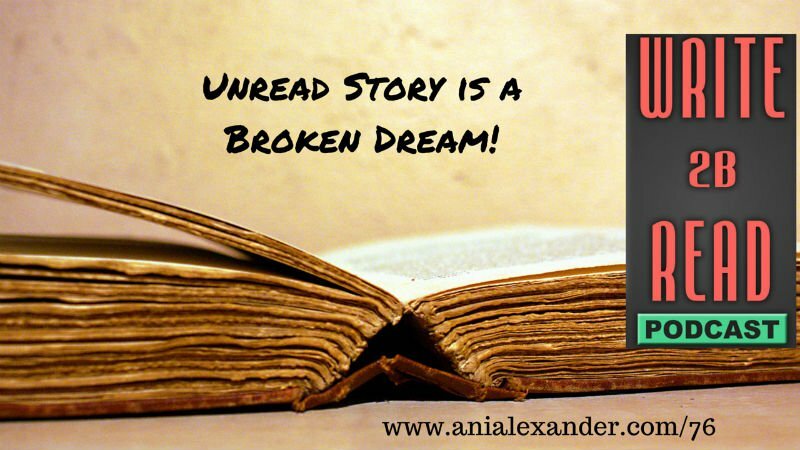 At the same time I believe that an unread story is a broken dream. Unread story is a broken dream. I know what I’m talking about because I’ve been there. I had different notebooks and word documents hidden far away. I’ve been their only reader and they felt lonely and neglected because of that. None of the books wants to be read only by its author. Maybe you are not ready to publish your book because you think it’s not good enough? Well, let me tell you something. None of the good writers are ever completely satisfied with their writing. They all think that it could have been written better. And that’s ok… No one’s first book has been perfect. But if not that first book… we would never have read author’s second, third and fourth books either. When I was launching this podcast my biggest fear was that no one would listen to me. Well if I listened to that fear and did not launch – no one would listen to me for sure… but you’re listening to me now right? Which kind of proves my point. Just don’t let the fear stop you. Go ahead and try and you’ll be surprised how wrong you were to feel scared. Do you dream of seeing your name on a bestseller cover? Do you have a special story to tell? Remember me talking about taking risks, getting out of the comfort zone and putting yourself out there? I am very excited about that. But I am also terrified .. Yes, both at the same time. That is because I have the same feelings one has while hitting publish. I have launched a Write 2B Read 8 Weeks Master Class for you to overcome everything I spoke about in this episode. Remember I told Unread story is a broken dream? I want to change that for you. With this Master Class that I have created I want your dream to become reality. I am not sure you know this, but I spent years in the high stress corporate world as a marketing specialist for big brands… until I finally burned out and decided to strike out on my own. It was a difficult decision, but looking back now I can say it’s been one of the best ones so far. I decided to follow my passion and become a writer. The only problem was… I knew nothing about writing, self-publishing and book marketing back then. Oh yeah and I also couldn’t afford to hire anyone to help me out. But what I did have was time (the one great benefit to being jobless). That was until I finally became Amazon bestselling author – twice. But believe me I did it the slow and the hard way. That is why I want to help you avoid all the mistakes I’d made and save your precious time so you can spend it on writing instead. The Write 2B Read Master Class will have your book published in 8 weeks. Basically by the end of week 8 you will be all set for your exciting journey of becoming an author, with your book already available for sale on Amazon and paperback! You will become part of the exclusive Facebook Group where you will meet like-minded people and get direct access to me there. You will get feedback on your ideas (book title, cover, concept, launch plan, etc. ), present your problems and get help and the members may become part of your book launch team. I know what you might be thinking… Actually Few days ago I saw a similar program which was priced over $1,000. Remember when I told my story? I needed something like this but I could not afford paying thousands of dollars. And I don’t want you to that either. That is why the price of the 8 week master class is only $149. The Master Class starts on March 20 and the group will be limited to 25 people. 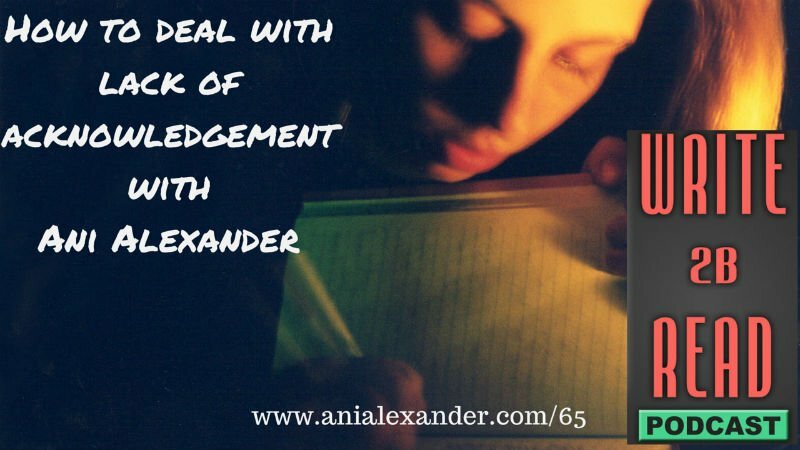 25 people only because I want to ensure that I have enough time to provide you with the personal support, encouragement and over the shoulder guidance on top of the knowledge you’ll be getting. Please do not hesitate to contact me and ask anything you need to know but could not find on the website. I will be more than happy to meet you in the class. Well that was all I wanted to share with you today… Just like I feared that no one would listen to my podcast, now I am scared that no one would enroll to the Master Class. I truly hope you’ll prove me wrong again. Please feel free to join me and other Write 2B Read podcast listeners at our Facebook group. 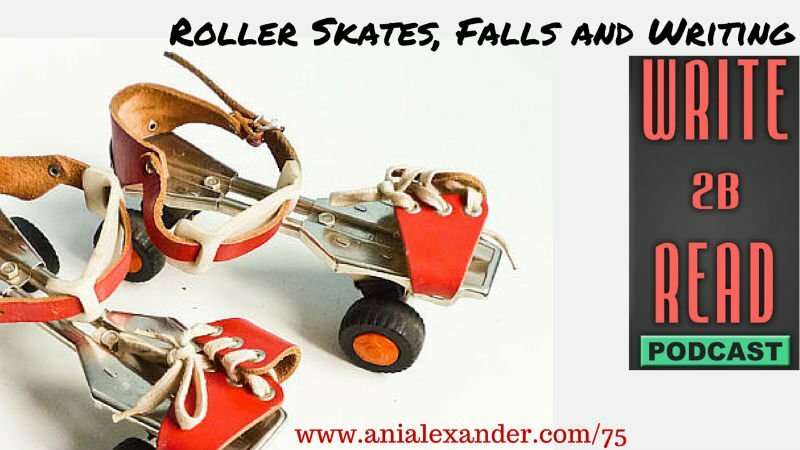 When I was about 6 years old I got my very first roller skates. To be honest I don’t even remember where they came from, but they were very classy for the Soviet times. The skates were from those you attach to your shoes, with red leather upper side and laces… they had 4 rubber wheels each. Two in front and two in the back. Oh and the size was adjustable, so I could use them like forever… or until they broke or something. I was even more impatient than I am now. And people who know me well will tell you that I am one of the most impatient people they have ever met. No, I did not go outside – because those who know me well will also tell you that I absolutely and intensely hate cold. So I decided to make my first tries on our living room carpet. Well, although it is not so obvious but in fact it does. I can link it to writing, to entrepreneurship and anything else that requires the right mindset. The thing is, when I got those shiny skates I did not think that I can’t skate. When I was falling on the carpet over and over again it never occurred to me that I will not be able to learn. I did not even consider giving up. It was not an option I would choose because I never even thought that it could be one of the options. So what happens to us when we grow up? Why do we start getting all those negative thoughts triggered in our mind? Why every time we write something we keep thinking that it is not good enough? Why do we have so many doubts about sharing our writings with the world? How come our 6 years old self is so much stronger? How come she keeps standing up after every fall until she reaches the point when she doesn’t fall anymore and we, instead close up and stop writing after getting a negative feedback? Back then I did not spend hours on that carpet because I wanted others to admire when they saw me skating outside, no. I did that because I wanted to skate. I wanted to be one of the people who can do that, that’s all. So why do you write? You write because you want to sell your books, or you write because you want to be a writer? Do you think about giving up, because you lack encouragement and inspiration? Do you think you can’t succeed because you have only 2 readers and one of them is your mom? Just like my first tries in the living room, your stories too will not be perfect. Some of them will even be terrible. So what? Do you have to conclude that you can’t write just because your first story is not a masterpiece? Who’s first story was? Just like my 6 years old me you have to practice too. You have to write, erase, tear up the paper and start all over again. With each try things will go smoother. With each next try you will enjoy it more… and your each new version will sound better and the story will be stronger. All those things you are longing for now – the readers, the fans, the book sales, your name on the bestseller’s cover… it all will come with the time. It will… but ONLY if you don’t give up and start over after each thorn paper and each erased paragraph or deleted document. I am sure you have your own examples of your 6 year old strong self. Recall those, admire your little self and try to be like that strong will child. So next time you feel discouraged, you feel down or feel like giving up – re-think again, get back your positive mindset and try again. Or write me an e mail and I’ll cheer you up! A while ago I told you the story of how I started writing. I still can’t explain why and how exactly that happened. But after the first poem, which I wrote I’ve been writing on and off for 20 years already. Just like most of you I did not share my writings with the world and kept them to myself. I did not even read most of what I’d written, because I loved and enjoyed the process of writing more than the result itself. After a while though I decided to show it to my mum to get opinion. I handed her the piece of paper with my hand written poem on it and asked to tell what she thought. Mum took it, read it and told only two words – “not bad”. Although the feedback was not negative, I took it exactly that way. The expression of her face and the way she pronounced those two words sort of showed that she meant just the opposite of what she said. And although, maybe I have let it go, I have not forgotten that moment. That was my very first experience facing criticism. Was I upset? Yes, I was. Did I stop writing? No, I didn’t. I kept on writing in the evenings in my room while listening to music through my earphones and drinking beer straight from the bottle. I was aware of the fact that most 16 year old girls spent their evenings differently, but honestly I did not care. I sent the letter and completely forgot about it. That is until I received a reply. I held the closed envelope and took some time to collect courage and open it. When I finally did and read the letter I absolutely had to show it to my mum. There were two main messages I wanted her to read from there. The first one said that according to the jury I had talent (which I did not believe btw) and the second message said that I was among the semi-finalists of the competition. Well it appears that after jury’s letter and acknowledgment mum took my writings more seriously. I can’t tell she liked them – she still probably didn’t, but she accepted the fact and believed this time that my writings were “not bad”. Those who have heard me tell that you as a writer don’t need anyone’s permission and acknowledgment to write and be a writer might think that I contradict myself. But I don’t. The thing is… that letter did not change much in how I saw my writings. It did boost my ego a bit, I admit… but I still did not think I had talent, I still enjoyed the process more than the result and I still did not consider what I did as something more serious than a hobby and escape from the reality. What the acknowledgement did was impress others and bring in credibility to what I wrote in other people’s eyes, not mine. Somehow it seems like others need that acknowledgement more than yourself. It impresses people and makes them look at you with different eyes. But does that acknowledgement change the way you write? Does it make you a better writer? Does it change you as a writer at all? I think the reason it did not change much in me was that I was writing for myself at that stage. I did not need to share my writing, I did not aim to publish my poems and I was not looking for a fame. I knew I could write, I loved doing it and I wrote to either cope with the reality or escape it altogether. I wrote regardless of whether mum or others liked what I’d written or not. I wrote regardless if the jury thought I was good or not. I did not need the permission to continue writing. And the acknowledgement I received simply meant that maybe what I wrote was “not bad”. You think you need many people to like your books, in order to consider yourself a successful writer? You think you need to become a bestselling author in order to prove yourself and others that you’re good? You think good reviews will make you a good writer? You think 1,000 true fans is a proof of your talent? Although I think that none of the above will happen until YOU accept your writing, until YOU believe that you are good and until YOU make the decision to collect the courage and become vulnerable by putting your writing out there. And just after you put it out there – make the decision that if you get “not bad” as a feedback you will not give up and continue writing anyway! I am really happy to announce that last week my podcast passed 50k downloads. This may not sound too much for some, but for me it is very special. The reason is – when I was launching Write 2B Read the biggest fear I had was that no one will listen. That’s what I was scared of most. So reaching 50k downloads is huge! To celebrate that (+ my birthday this month) I created a giveaway for writers, which you can see here. The winner will get Scrivener + 2 books, which will help become successful self-published author. Please check it out and share with those, who might be interested. As you already know the podcast is sponsored by the Author Marketing Institute. AMI wanted me to let you know that their next event for authors is coming up at the end of Jan. It’s called Author Marketing Live and it’s a virtual conference. That means you can attend from your home or office and see all the presentations via your computer or tablet. Grab a seat today to learn from best sellers like Steve Scott, Joel Comm, Lewis Howes and Peter Shankman, and more. You can grab a ticket to the event for only $99 if you use the coupon code “ani” during checkout. That’s $49 off the regular ticket price. Just visithttp://www.authormarketinglive.com to register.